Always ON Webinars work for you, even while you sleep. Don't have time to do all you need to do for your business? Many small to medium sized businesses simply do not have enough personnel on staff to do all the marketing that needs to be completed online, on a continuous basis. Advertising online is an ever expanding circle of items that it is very hard to keep up with, even for those of us who work mainly online. It can be grueling to find out what is needed, to name those things, and then to understand them all. How do you need to present your business to stay current with online trends? 01 - Networking with other businesses who are in the same boat as you are can help you find answers when there are experts presenting information that you need to know. 02 - Researching what might help you further understand the need to be online in many different instances; a website is only the beginning. 03 - Find NEW Avenues to represent and showcase your services or products. Easier said than done. Simple as 1-2-3 "Always ON Webinars" simply means MORE exposure, in a broader sense, which may help bring traffic and sales to your business. By gaining more visibility and exposure Synergistic Business Marketing can help you decide which type of webinar would be most advantageous to spread your message to the general public and most importantly, to your specific industry as a showcase piece. Utilizing tools like Google Hangout Videos, BrainShark Presentations, Start Meeting, Prezi Presentations, and more, 'Always ON Webinars' may be the exact thing you have been skimming over because the tools necessary may seem too complicated to tackle. Showing the public what you are all about and what you have to offer, in a detailed fashion, could be the boost you have been needing to draw the attention necessary to further your online endeavors. 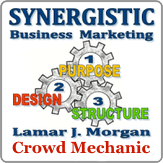 Contact Synergistic Business Marketing today to see what we can do for you.